Greg Combs, a recent PhD from UT Dallas (and fellow Sleestak fan), has assembled one of the coolest political iPhone apps I've ever seen. It's called TexLege. Basically, it's just a really sophisticated directory of the Texas state legislature. It's far better than any app I've seen for the national government, and I don't know if any other serious apps exist for state legislatures. The upper screenshot at left shows the main alphabetical listing of legislators. Note how each line shows you the name, the photo, the party, the district, and the number of years of service. Plus, you see that red-blue bar with the star? That's an estimated ideal point derived from legislative roll call votes. How cool is that? That's a lot of of information displayed in a very economical way. The lower screenshot shows the entry for one particular member. Here we get to see a comparison of the member's ideal point with those of the two major parties over time. Scroll down further and you can see which committees he serves on, contact information, an interactive district map, the Votesmart profile, and other things. The version of TexLege up on the App Store right now is a bit outdated -- Greg has been letting me demo the new version. Unfortunately, I believe he plans to ask $10 for the new one. Still, I'd imagine that a number of lobbyists would be okay paying for that -- this could be a very valuable resource for them. I wonder if Greg would be willing to partner up with some other state legislatures or the NCSL to export this technology beyond Texas. There's a great story going on in the Colorado governor's race with regards to third parties. When Tom Tancredo jumped into the race as the nominee of the American Constitution Party, he was polling around even with Dan Maes, the Republican nominee. That's certainly impressive, and attributable to Tancredo's own widespread name recognition throughout Colorado (and Maes' relative lack thereof). Given what usually happens with third party candidates, one would generally expect that Tancredo's support would wane and Maes' would increase as the campaign brought Republican voters back to their own party's nominee. That hasn't happened. 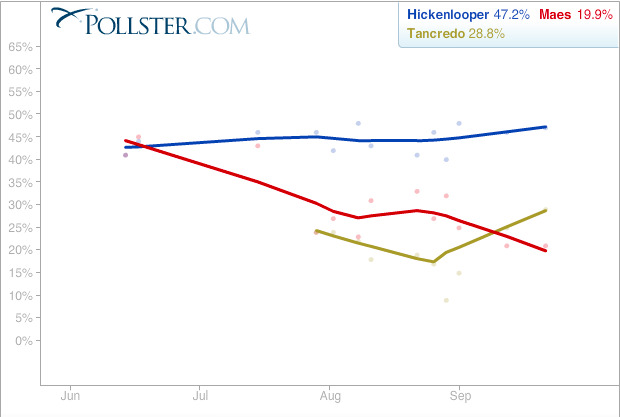 Indeed, recent polling suggests that Tancredo's share of the polls is increasing at Maes' expense. Tancredo's also massively outpacing Maes in fundraising. During the first two weeks of September, Maes raised less than $15,000, most of which went to pay off a campaign finance violation penalty. Why is this happening? This strikes me as an endorsement story. There's a good reason Tom Tancredo has never won an election outside of Colorado's 6th congressional district. He's extremely conservative and bombastic. That's normally toxic to mainstream party elites, who have generally avoided backing him in statewide (or presidential) runs. But now GOP party elites are trying to get Dan Maes, whom they view as a colossal mistake, to drop out of the race, and they're doing so by backing Tancredo. The list of Tancredo endorsers includes relatively mainstream party folks like Bob Beauprez (the GOP's nominee for governor in '06), Josh Penry (who dropped out of the governor's race last year), and former state Rep. Rob Witwer. Their backing is an indicator to other Republicans that it's safe to like Tancredo this year. The OkCupid dating service decided to do a study of the profiles of half a million of its subscribers, looking at which terms and phrases subscribers use to describe their interests and breaking down the results by race and gender. They provide some wonderful word-cloud analyses. The results are amusing, if not terribly shocking. White guys, the study summarizes, are into "sweaty guitar rock, bro-on-bro comedies, things with engines, and dystopias," while white women seem to be into "bonfires, boating, horseback riding, thunderstorms." They further summarize these two categories as "frat house" and "escapism." Pretty interesting interactions of race and religion in there, as well. I've never figured labor unions for angels, but it is a sacred principle in our family that one does not cross a picket line. Picketers are risking their own livelihoods for a chance at a better work environment using the one advantage they have over corporations -- collectivity. Whether we agree with the union's goals or not, I teach my children, we must respect the risks they are taking and honor their struggle. Or so I thought. I have to say that this Daily Show segment, in which we learn that a UFCW local is hiring temporary picketers at non-union wages, was an eye-opener for me. Kudos to Comedy Central for providing actual investigative journalism. France apparently has a program by which urbanites are paid (modestly) to go to the countryside and convert rundown farm houses into rural inns. Sounds like a win-win: the Parisians get to experience country life and get their hands a bit dirty while the beauty of rural life is preserved even as people leave the farm. Clever. And let me take this opportunity to salute the article's author, Enik Rising regular reader Marc Herman, who managed to finance a bike ride through France by selling the story to the Atlantic. Even more clever. You can listen to my 17 seconds of taxpayer-subsidized fame here. How much did the health care vote hurt? To see how House members were doing, I used 538.com's brilliant election forecasting site. * I decided to look at the members from the 50 most conservative congressional districts (as measured by the 2008 vote for McCain) that are represented by Democrats. These range from Florida's 22nd (represented by Ron Klein), where McCain got 48 percent of the vote, to Mississippi's 4th (represented by Gene Taylor), where McCain pulled 68 percent. Out of the original 50 districts, only 41 had members who cast a vote on health care reform and are running for reelection. If we just divide these members based on their health care votes, those who voted for health reform are running 2.7 percentage points behind those who voted against it. But, of course, we should control for other things, especially district conservatism, since those from the more conservative districts voted almost uniformly against reform. I also included the members' DW-NOMINATE scores to distinguish the health care vote from the members' overall voting records. What I found was that Democratic supporters of health care reform are running 3.2 percentage points behind Democratic opponents. (This is statistically significant at the p≤.05 level.) That's a three percentage-point penalty resulting from a single roll call vote. I would describe that number as large. Most members of Congress win by much greater margins than that, of course, but for Democratic incumbents from conservative districts in a distinctly anti-Democratic year, three points is serious business. Indeed, of the 41 Democrats I examined, only six are currently forecast to win by more than three points (and none of those voted for health care reform). *The 538 forecasting site is far from perfect, and I question some of their results. For example, they suggest that Rep. John Salazar in Colorado's 3rd will only get 48 percent of the vote, which I think understates his support significantly. But they're depending on polling, which is pretty scant in most congressional races. Regardless, 538's site is far and away the best thing going on out there in terms of House election forecasting. Thanks to Wesley Hussey for the tip. Update: The data are available here. I can’t imagine much would be lost if Senators felt free to choose their primary residence without worrying about whether they’d be accused of “going Washington,” or if Barack Obama could pick his vacation spot without worrying about its effect on public opinion polls. The problem is that I’m not sure you can separate this particular baby from this particular bathwater. A Member of the House who realizes that she can skip a few fundraisers because incumbent spending in elections is subject to severe diminishing returns might also realize that she can skip a bunch of committee meetings, because no one in the district really cares (especially since the local paper long since has closed its Washington bureau). A Senator who realizes that it doesn’t matter much whether or not he gets time on the evening news back home might also realize that he can in most cases ignore the preferences of his district on issues of public policy. A president who understands that his ability to move public opinion is extremely limited might just not bother holding press conferences or otherwise giving any access to the press. But I take issue with Jon's contention that we can't separate the good kind of ephemera from the bad. To go off one of his examples, I really doubt that most members of Congress attend committee meetings because they're concerned that voters are watching the hearings on C-SPAN and taking roll. They attend because they know it's part of the job, because they're socialized into it, because they'll catch grief from their colleagues if they don't attend, because their party might get rolled on an important vote if they don't show up, and because their colleagues might not be there for them the next time around if they aren't there for their colleagues. I also doubt that exposing politicians to political science would cause them to shirk their districts. After all, there are a number of solid studies (like this one) showing that members of Congress who don't vote their districts have a harder time getting reelected, even if no one individual roll call vote particularly matters. Members would still know this, and if they didn't, they'd eventually be replaced by people who did. I recognize we're in the realm of political science fantasy here, but I believe that elected officials would still have plenty of motivation to actually represent their constituents and do their jobs even if they didn't go on audience-less Sunday talk shows or poll-test their vacation destinations. I'm not sure how we get to that point, but I think Ezra's column is a start. I've never conducted an interview on a radio show. I assume it's difficult to think on your feet quickly enough to challenge a guest when they're obviously lying to you. On the other hand, we might expect people who choose that line of work to have some skills along these lines. SIMON: Congressman, can you reduce the deficit and cut taxes at the same time? Mr. PRICE: I think you can, and I think President Kennedy proved it. I think President Reagan proved it. The fact of the matter is when you decrease taxes in our economy and allow individuals to keep more of their hard-earned money, what you do is actually increase the economic vitality and productivity of this country. And a byproduct of that, gloriously, is more revenue for the federal government. SIMON: Congressman Tom Price of Georgia speaking with us from his office in Marietta. Thanks so much. "Do you realize what the hell you just said?" "Are you at all constrained by the truth?" "Were you in a coma during the 1980s?" "What are you smoking right now, and can I have some?" "President Reagan reduced taxes, and the deficit soared. How does this prove your point?" There are plenty more that would be far better than "Thanks so much." Ezra Klein visited APSA last weekend and came away with a few important lessons, which he highlights in this excellent Sunday column. Among these lessons: presidential speeches don't really sway public opinion, lobbyists don't have nearly the power they claim to have, and moving to a citizen-legislature just empowers lobbyists and bureaucrats. But the most important lesson, to me, is that most of the stuff that politicians and journalists are obsessed with -- one-liners, gaffes, debate performances, media cycles, etc. -- don't actually matter very much. Political science really does empower politicians. It tells them to ignore a lot of gossip and trivia. It tells them not to sweat every rhetorical turn of phrase.... Freed from these concerns, politicians can, as Ezra suggests, focus on what they really can and do affect: the policy agenda and the content of legislation. As Ezra pointed out during the APSA panel on journalism, it's actually fantastic news for all of us that these little things don't matter. What if the fate of the Republic really was affected by Michelle Obama's choice of vacation destination? Would we want to live in such a world? Voters, for all their shortcomings, tend to vote on non-trivial things like war and the state of the economy, and good for them for doing so. I feel somewhat obligated to do some sort of a 9/11-themed post here. I don't have anything in particular to add about the political or moral lessons of that day -- others have done this far better than I could. I consider myself fortunate that I didn't know anyone who died that day. Strangely, one of the memories that lingers with me is the time my grandfather took me to lunch at Windows on the World, the restaurant at the top of One World Trade Center, probably in 1979 or 1980, when I was around ten years old. I can still remember sipping cocoa and watching the city far, far below. We were just two of the probably hundreds of thousands of people who ate there during the restaurant's 25-year existence, but it was a special treat for me at the time. It is unsettling to me that I am the only thing remaining from that event. I took my students on a tour of the Colorado capitol building today. Like most state capitol buildings, this one does a nice job honoring unique aspects of its home state. It's manufactured primarily of materials from throughout Colorado -- it helps that this is a big mining state. One mineral on display throughout the capitol is rose onyx, which comes from a quarry in Beulah, Colorado. Rose onyx is a rare mineral, so rare that the entirety of the world's supply of it went into the construction of the Colorado capitol. So, in honoring the materials of which Colorado is made, the builders actually removed one of those materials from the Earth entirely and placed it in the capitol. So now the building honors something that no longer exists outside it. Weird. Is there a risk to academic bloggers? As I heard it explained to me, it’s not merely that taking time to help inform a non-specialist audience about political science findings isn’t specifically rewarded, it’s positively punished. And not simply in the sense that doing less research and more publicizing is punished; I was told that holding research output constant, getting more publicity for your output would be harmful to a junior scholar’s career because it would feed an assumption of non-seriousness.... That’s pretty nuts. I agree. From my perspective, academics who blog -- who take the time to explain academic research in a way that non-academics can understand and care about -- are providing a real service, both to academia and to the intellectual world at large. But, as Nanny McPhee says, "It's rather sad, really, but there it is." Or, as Hyman Roth says, "This is the business we've chosen." Still, it's difficult to say whether an academic would be punished today for blogging. We act under the belief that such activities killed Dan Drezner's tenure bid in 2005, but of course we can't get definitive proof of that, and we don't know whether norms have changed in the past few years such that this behavior is no longer stigmatized. No senior faculty member ever goes on record saying that blogging in itself is a strike against a promotion or hiring candidate. I don't think it hurt my tenure bid, but I don't think it helped, either. I suppose the only way we can know is by testing it further. As more academic bloggers come up for tenure, perhaps we'll get some real data, hopefully all on the side of refuting the hypothesis. So it looks like Obama is trying to push through a second stimulus package, but Democrats don't want to touch it. Even Michael Bennet, who is about as closely tied with Obama politically as one can get, is distancing himself from the president on this one. This is a classic Prisoner's Dilemma. Democrats no doubt want a stimulus to pass -- it would be good for their constituencies -- but none of them wants to be seen as the one that allowed it to happen. Any vote for more government spending right now will just be more fodder for Republicans in a very, very tough election for Democrats. Now, that doesn't mean that opposing a stimulus bill will earn a Democrat immunity from being portrayed as a big spender (although that seems to be Bennet's rationale), but it deprives the Republicans of one more piece of ammunition. Well, now that I think about it, it's not a perfect Prisoner's Dilemma. It would be perfect if passage of the stimulus (the collective goal) would save Democratic seats in November. It won't. The only thing that could do that is some serious economic growth, and no stimulus is going to do that inside of two months. So opposing Obama on this is a smart move politically for Democrats. Hell, Obama might have expected that, but is just offering a stimulus so that endangered Democrats have something on which they can distance themselves from him. The downside, however, is that the stimulus would probably help people get jobs, and that's not going to happen. And given what the Congress is likely to look like next January, that's not going to happen for a long, long time. Do more open primaries lead to less partisan politicians? If you followed the debate about California's Prop. 14 recently, you know the logic here. Basically, when you have a closed primary (that is, one that's limited just to party registrants), you end up with an ideologically extreme electorate that will only pick other extremists for office. If you open up the primaries to independents and moderates, however, you get less extreme officeholders. At least that's the idea. Does the evidence bear this out? No, not really. Eric McGhee, Boris Shor, Nolan McCarty and I presented some research at APSA last week looking at roll call voting in all 99 state legislatures, breaking the states down by the rules governing primaries. We found no consistent or clear effect of primary rules on the voting behavior of elected officials. States with open primaries have legislatures that are just as polarized as those with closed primaries. You can read the paper here. Why might this be the case? Well, one reason is that the insiders who dominate primary elections aren't really hampered by a primary electorate that includes moderates. 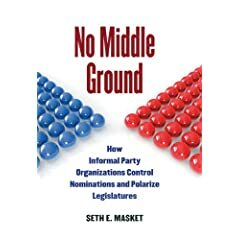 As long as they can limit the group of candidates to just ideological extremists (which they can do through the manipulation of resources like endorsements, funding, and expertise), they can prevent moderates from getting nominated. If you care about parties, you should be following the Colorado gubernatorial race right now. Last month, I explained some of the background of how Republican insiders tried to clear the field for Scott McInnis prior to the primary. This, of course, turned out to be a colossal mistake, as McInnis had a scandal that was about to emerge, which, along with some other weird trends this year, resulted in Dan Maes winning the primary. And, of course, Tom Tancredo decided to jump in as a third party candidate, which managed to make an unlikely Republican victory essentially impossible. Late last week, leaders of the state Republican executive committee met with Maes to try to convince him to drop out of the race. Just to be clear, yes, leaders of the formal Republican Party are begging their own gubernatorial nominee to drop out. Maes, who saw no love from the party establishment prior to the primary, now sees no need to acquiesce to their wishes, so he's staying in. I find this all pretty astounding. I can't recall a similar instance of a party's leaders trying to undermine their nominee for a top-ballot race. Sorr that I haven't had much chance to blog any of my experiences at APSA last week. I encourage you to read Jon Bernstein's account of the filibuster panel, which can be seen on C-SPAN. I attended some of this panel, which I found fascinating. I particularly recommend Steve Smith's material around 13:15 in which he notes how the filibuster distorts the legislative process and output. He holds the filibuster responsible for reducing the economic stimulus package by 20%, for the removal of the public option in health reform, for the delay of unemployment benefits extensions, for the diminution of a small business program, and other things, even while the overall passage rate of bills remains high. I am still processing the decision to include non-academics on some of these academic panels. I thought Ezra Klein's contributions to both the filibuster and the media panels were interesting and quite entertaining. Brian Darling's input on the filibuster panel seemed ridiculous at times, especially when he demanded that all senators read all legislation and that cloture requirements be ratcheted back up to 67 votes. On the other hand, I rarely experience strong emotions during academic panels, so it was kind of nice to do that once in a while here. 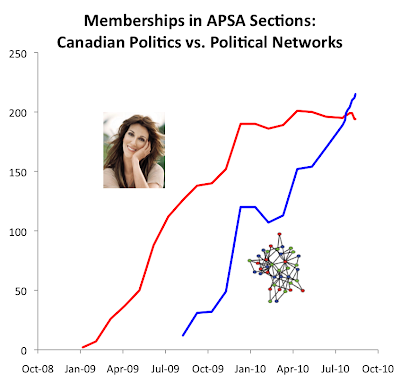 Below is a graph of APSA membership numbers for two sections, Political Networks (represented by a network plot) and Canadian Politics (represented by Celine Dion). I am the membership chair for the former. Our section's exceptional growth has unfortunately earned me a second term. I'm at the American Political Science Association conference right now. Not much time (or wifi access) for blogging, but I am occasionally tweeting. Kyle Baker alerts me to this story about the rather inauspicious end of this year's session of the California Assembly. For the Assembly, the curtain fell at midnight Tuesday after a final hour marked by animosity that began with a partisan fight that ultimately killed legislation to ban the open display of unloaded guns in most public places. When the smoke finally cleared, Republicans and Democrats were blaming each other for the verbal scuffle -- and Democratic Assemblywoman Lori Saldana was accusing her party leaders of ineptitude. The political slugfest began about 10:50 p.m., when Saldana began to present her controversial gun-carrying ban on the Assembly floor with only 70 minutes before the end of this year's regular session and, therefore, the deadline for acting upon majority-vote bills. Republicans quickly made it clear they planned to "run out the clock" by debating until midnight the controversial measure, Assembly Bill 1934, which called for outlawing the open public display of guns, with exceptions that include law enforcement purposes, hunting, target ranges and ceremonies. Democrats were alarmed by the GOP's stalling tactic because they had about a half-dozen other bills to take up, all of which were doomed if debate on AB 1934 lasted the entire hour. To me, this sounds like one of the down sides of term limits, which has produced a party leadership with only a few years of collective experience under its belt. The Speaker, while a bright and interesting man, is a freshman, for Heaven's sake. Situations like that lead to a majority party getting rolled.